Originally built in 1874 by Walter E. Olson as the manufacturing mill for the Olson Rug Company, 4000 West Diversey quickly became “the place” to buy rugs in Chicago. In 1935, Walter Olson brought in more than 800 tons of stone and 800 yards of soil to build Olson Memorial Park, and its centerpiece, the Olson Waterfall. Named as one of Chicago’s Seven Lost Wonders by the Chicago Tribune (August, 29, 2005), Olson Waterfalls and Rock Garden was one of the most beloved family attractions in the City until it closed in 1971. In 1965, Marshall Field & Company purchased 4000 West Diversey and reopened the facility as a massive department store. In 2005, the warehouse was sold to Macy’s, Inc., as part of its purchase of Marshall Field’s, and the warehouse spent three years as a home for one-off sales, before being shuttered in 2008. In 2014, 6 years after the building had closed, its ownership began drawing up plans for a a multi-phase redevelopment of the Marshall Field’s facility. 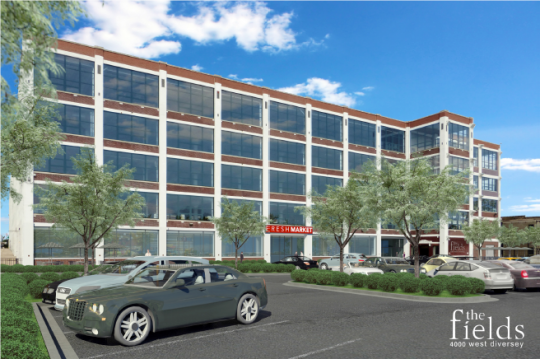 The first phase of this redevelopment included a 68,000 sf Cermak Fresh Market grocery store on the first floor, which would serve as the anchor, catalyzing further development. Founded in 1986 by Dimitrious “Jimmy” Bousis and his late partner Pantellis Tzotzolis, Cermak Fresh Market has grown from a single 2,500 sf Central Park Produce store to 11 full-service grocery stores, including the recently-completed store in Milwaukee, WI, the operator’s first outside of Illinois. The family-owned business enjoyed early success by catering to the Puerto Rican community in Chicago’s Humboldt Park area. As it grew, the grocery chain broadened its focus to serving all of Chicago’s various ethnic communities and today, Cermak Fresh Market is a full-service international grocery store. On September 16, 2015, Crescent Growth Capital and Cermak Fresh Market closed on a stacked $7.5MM State/$6MM Federal NMTC structure, using Illinois State NMTC allocations from the Southside Community Optimal Redevelopment Enterprise (SCORE) and the Valued Advisor Fund (VAF), and Federal Allocation from SCORE. The NMTC financing provided the necessary funds to renovate a portion of the first floor for Cermak Fresh Market, and the combined State and Federal NMTC subsidy drastically reduced Cermak’s cost of capital, substantially improving the prospects for the new store.